A large two storey cement rendered house in the Italianate style. Pre-history: Before Crathre House was built there was another house on the site - a large wooden house known as The Bungalow. This house was owned by Henry Dyer as an investment property. He lived next door at 121 Powlett Street with his wife, Mary, and their children. He owned many other properties in the immediate vicinity. Henry died in 1869 leaving his property to his wife in trust for the children. Mary soon after married the tenant of The Bungalow, Gavin Brown, a stockbroker and one of the founders of the Stock Exchange. History: 1874-1904. In 1874 the Browns built the existing house on the site of The Bungalow. The new house was also called The Bungalow during the family's ownership of it. Originally the wing on the north-west of the building containing the kitchen and larder was single storey but in 1891 a bedroom and bathroom were added above. This coincides with the period of Mr. Brown's final illness during which, according to his obituary, he was recommended to "take a medicinal bath twice a day, and to enjoy the air on the balcony of his home". It seems that the addition was a purpose built sick room. Probably, too, it was at this time that the French doors on to the balcony were installed in place of the original double hung window. Mr. Brown died in 1898 and his widow afterwards ran the property as a lodging house until her own death in 1902. During this time John Monash (later General Sir John Monash) and his wife were residents. 1904-1914. Upon the death of their mother, Henry Dyer's children inherited the property, and in 1904 sold it to Eliza Welch (of the old Ball and Welch department store family) who continued to run it as a boarding house. A Board and Lodging advertisement in the Argus offers "private table in dining room"
1914-1933. 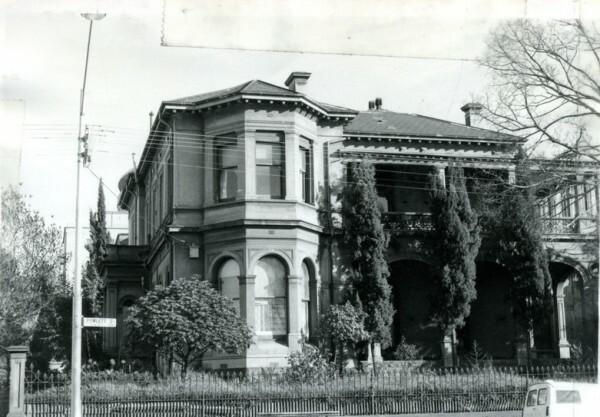 In 1914 the house was bought by Jessie McHardy White who turned it into a private hospital called Crathie (note spelling) House Private Hospital. Crathie was no doubt named after the place of the same name in Scotland. Many alterations took place at this time. The larger rooms were divided into smaller ones and a new wing was added along the southern boundary. Mr. Brown's sick room became the operating theatre. It remained a hospital until 1933. 1969-1980. Paxton sold to Solomon Handelsman in 1969 who intended to demolish the house and build six villa units. This provoked a storm of protest from the National Trust, the East Melbourne Group and individual local residents who mounted a protracted and ultimately successful campaign against the proposal. As a compromise Handelsman was granted a permit to turn the house into medical suites and in 1980 he put it up for sale with the permit. 1980-2005. Peter and Sylvia Black bought the house and restored it to its original use as a family home. It took over a year to complete and in that time everything was renewed from top to bottom. The south wing was demolished and internal partitions removed. The house was sold to its present owners in 2003. Extensions on the northern boundary and to the west of the building, including a garage, were added in 2005. At the same time an opening in the stone foundations was created to allow access under the house. The house is listed on the registers of the National Trust, National Estate and is graded A by the Melbourne City Council in its Conservation Inventory. The Argus, 2 June 1910, p.4.